Join us for the 2012 Bellco Colfax 5K on Saturday, May 19, 2012 at 9:00 a.m. The event takes place in Denver’s City Park, and kicks off the Kaiser Permanente Colfax Marathon weekend with a race for everyone- with a start and finish at the official Marathon Start and Finish Line. It’s a chip timed race, where seasoned runners can strive for a PR, or newer runners can jog and walk at their own pace. The Bellco Colfax 5K has a separate start wave for walkers, kids and families, and a one mile shortcut. Awards for the top ten male and female finishers (based on gun time). All participants receive a race t-shirt, music, and delicious finish line food provided by Garbanzo's. The race welcomes local charities to participate in the DaVita Charity Partners program, where nonprofits recruit runners to raise funds for their cause. Kids under 12 who raise $50 or more for one of our 2012 Charity Partners get a FREE entry to the Bellco Colfax 5K through the High Five Youth Fundraising Program, sponsored by Primrose Schools. The 5K distance is appealing to charities focused on children, like Whiz Kids Tutoring, which provides after-school, one-to-one tutoring program for disadvantaged students throughout the Denver Metro area. “The distance was perfect for us to have our volunteer tutors run with their students,” said Jedidah Frederick, Program Administrator, Whiz Kids Tutoring. "Our race mission is to encourage a healthy and fit community, and provide a distance for everyone," said Andrea Dowdy, Executive Director of the race for the third year. Online registration is open at www.runcolfax.org. WHEN: Saturday, May 19, 2012, 9:00 a.m.
About: The Bellco Colfax 5K kicks off marathon weekend on May 19, 2012. 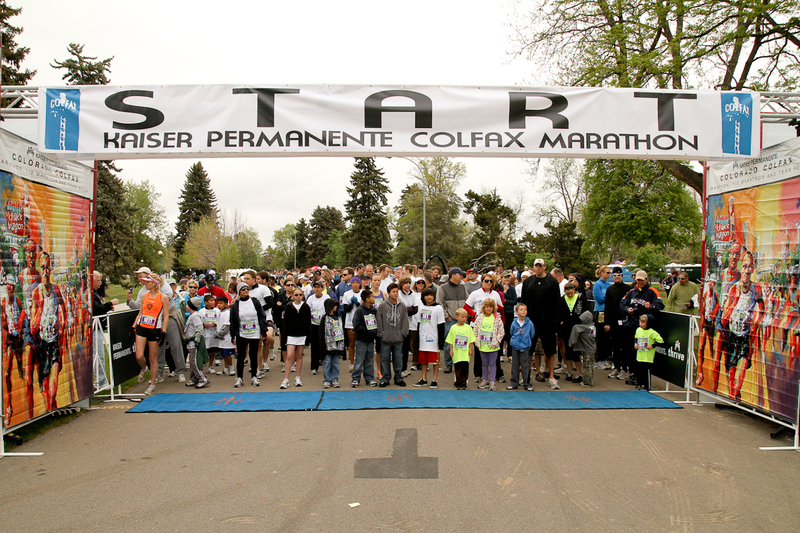 The Colfax Marathon, Half Marathon and Marathon Relay takes place on May 20, 2012. Denver's springtime race is on a mission to encourage a healthy and fit community. We support local nonprofits through one of the country's biggest Charity Partners Programs. A portion of the proceeds from the Colfax 5K benefits The Denver Post Community Foundation, which strives to improve and enrich the lives of those in our community by supporting Denver area nonprofits in the areas of arts and culture; children and youth; education and literacy; and the provision of basic human services. About Kaiser Permanente: Kaiser Permanente Colorado is the state’s largest nonprofit health plan, proudly working to improve the lives and health of Denver, Boulder, and southern Colorado area residents for more than 40 years. Kaiser Permanente Colorado provides comprehensive health care services to more than 535,000 members through 24 medical offices and a network of affiliated hospitals and physicians. The health plan was named “Highest in Member Satisfaction” among Commercial Health Plans by J.D. Power and Associates for the fourth straight year. Kaiser Permanente was also recognized by the National Committee for Quality Assurance (NCQA) as the top-ranked private health plan in Colorado, No. 6 in the nation and one of the top 3 Medicare plans in the U.S. for the third year. About Bellco: Bellco is one of Colorado’s largest financial institutions, with over $2 billion in assets, more than 350 employees and 15 branches in Colorado. Founded in 1936, Bellco offers a full range of financial products and services including mortgages, auto loans and checking accounts. Today, Bellco has more than 200,000 members and over 1,000 Select Employee Groups who benefit from the advantages of a credit union, including lower interest rates on loans, higher yields on savings and access to thousands of surcharge-free ATMs. Bellco actively supports the community by donating funds and employee volunteer hours to many Denver-area and Grand Junction organizations. Visit Bellco online at www.bellco.org, “like” Bellco on Facebook or “follow” @Bellco_CU on Twitter. About DaVita: DaVita Inc., a Fortune 500® company, is a leading provider of kidney care in the United States, delivering dialysis services to patients with chronic kidney failure and end stage renal disease. DaVita strives to improve patients’ quality of life by innovating clinical care, and by offering integrated treatment plans, personalized care teams and convenient health-management services. As of Dec. 31, 2011, DaVita operated or provided administrative services at 1,809 dialysis facilities in the United States, serving approximately 142,000 patients. The company also operated 11 outpatient dialysis centers located in three countries outside the United States. DaVita supports numerous programs dedicated to creating positive, sustainable change in communities around the world. The company’s leadership development initiatives and social responsibility efforts have been recognized by Fortune, Modern Healthcare, Newsweek and WorldBlu. For more information, please visit www.davita.com.